The regulation of the succession planning is a unique challenge in the life of an entrepreneur. It means for him to find a viable solution, which leads on his life’s work into a new future with all hanging ties and connections. Therefore, one of the most important strategic tasks of responsible corporate governance is to ensure the company’s succession. The implementation of a “correct” solution for succession requires a suitable period of time. The sooner the succession management will be planned, the better is the way to find a good and valuable solution for all participants. Our consulting services go over the entire course of a business transaction. We carry a qualified business valuation for you. Together with you we will structure the transaction in advance. After that, we speak to highly targeted potential corporate buyers and target companies. would like to take over the lead in negotiating the transaction. 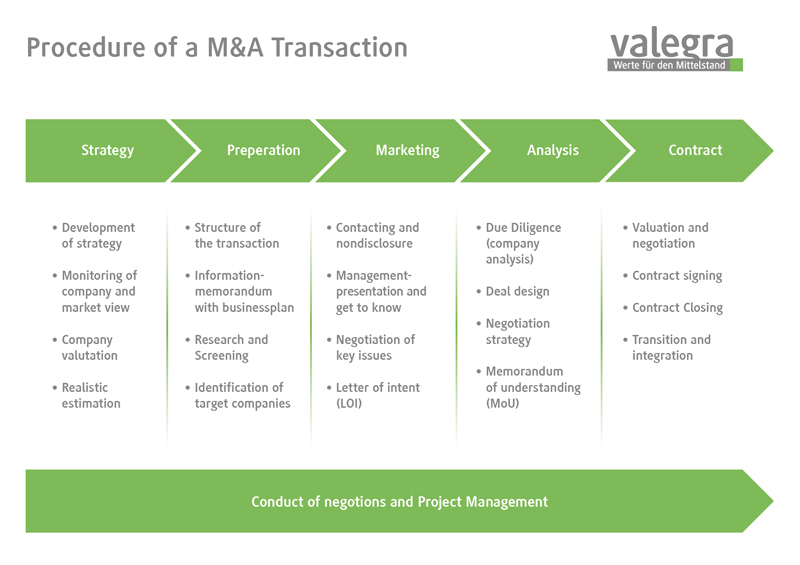 Project management completes our scope in the context of corporate transactions. If you wish to purchase a company or plan to grow inorganically, we offer our qualified, solid advice on course even when buying a business. A key competitive factor is the quality, how companies plan and implement its corporate finance structure. Traditional funding sources become less important. The “ups and downs” on the international financial markets in recent years show that if you have a stable and continuous funding for your company it allows you a lot of options. A funding approach, tailored to your needs, creates room for growth and investment. We are independent. We support you in the development of tailored financial solutions through a variety of financing instruments such as debt and equity, mezzanine capital, etc.. Our consulting expertise includes the creation of business plans and negotiating with banks and credit institutions. Our support to a monthly reporting of financial data will help you and shows the banks the necessary transparency. Through an extensive network of trusted partners, we can specifically discuss service solutions together with you and implement them targeted.